The winners of the Development Project of the Year (up to £5 million) award. For the first time, Lincolnshire celebrated its multimillion pound construction and property industry by launching a new set of industry awards. The Lincolnshire Construction and Properties award ceremony, hosted by Lincolnshire Chamber of Commerce, was run to recognise, unite and champion the county’s leading construction and property businesses, and the dedicated people who work so hard behind the scenes. 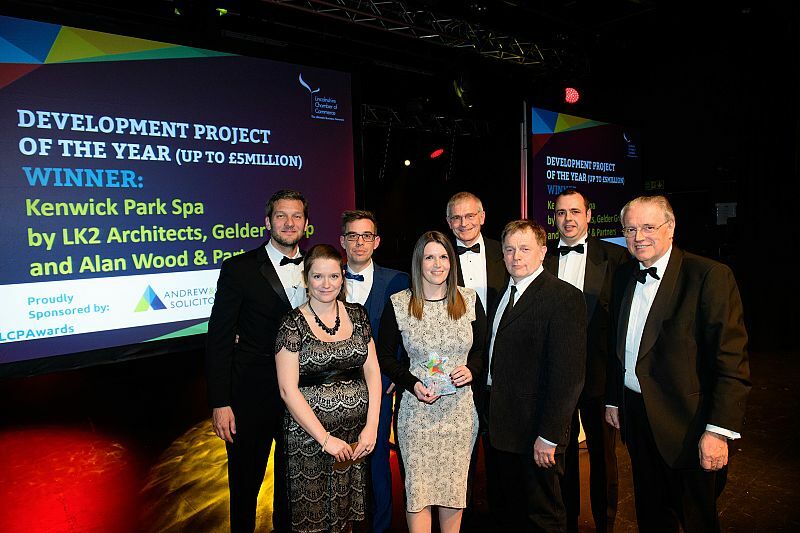 Our Major Contracts division was delighted when it was announced that Kenwick Park Spa had won the Development Project of The Year (up to £5 million) award – sponsored by Andrew & Co Solicitors. Cartergate also received a Highly Commended for Development Project of the Year (over £5 million). This was the sector’s first award ceremony and it was a brilliant turnout. The awards ceremony has certainly paved the way for subsequent events, and we hope to be involved again. Well done to all the teams involved!